After you have loaded your data you will probably want to update and save the changes. Applications will usually have a couple of ways in which data is saved. The first one is obviously through web forms and the other is by directly generating or changing data in the code to be sent to the database. CakePHP will know whether to perform an insert or an update based on the return value of the isNew() method. Entities that were retrieved with get() or find() will always return false when isNew() is called on them. // The foreign key value was set automatically. When modifying records by directly setting or changing the properties no validation happens, which is a problem when accepting form data. The following sections will demonstrate how to efficiently convert form data into entities so that they can be validated and saved. If you are using newEntity() and the resulting entities are missing some or all of the data they were passed, double check that the columns you want to set are listed in the $_accessible property of your entity. See Mass Assignment. The Using A Different Validation Set For Associations chapter has more information on how to use different validators for associated marshalling. You can always count on getting an entity back from newEntity(). If validation fails your entity will contain errors, and any invalid fields will not be populated in the created entity. When the above data is converted into entities, you will have 4 tags. The first two will be new objects, and the second two will be references to existing records. When converting belongsToMany data, you can disable the new entity creation, by using the onlyIds option. When enabled, this option restricts belongsToMany marshalling to only use the _ids key and ignore all other data. When converting hasMany data, you can disable the new entity creation, by using the onlyIds option. When enabled, this option restricts hasMany marshalling to only use the _ids key and ignore all other data. The above will keep the association unchanged between Comments and Users for the concerned entity. Associations are merged by matching the primary key field in the source entities to the corresponding fields in the data array. Associations will construct new entities if no previous entity is found for the association’s target property. For belongsToMany associations, ensure the relevant entity has a property accessible for the associated entity. For hasMany and belongsToMany associations, if there were any entities that could not be matched by primary key to a record in the data array, then those records will be discarded from the resulting entity. Remember that using either patchEntity() or patchEntities() does not persist the data, it just edits (or creates) the given entities. In order to save the entity you will have to call the table’s save() method. As you can see, the comment with id 2 is no longer there, as it could not be matched to anything in the $newData array. This happens because CakePHP is reflecting the new state described in the request data. Some additional advantages of this approach is that it reduces the number of operations to be executed when persisting the entity again. As you can see, this also helps creating solutions where an association needs to be implemented like a single set. // Include use statements at the top of your file. The $data parameter is an ArrayObject instance, so you don’t have to return it to change the data used to create entities. The main purpose of beforeMarshal is to assist the users to pass the validation process when simple mistakes can be automatically resolved, or when data needs to be restructured so it can be put into the right fields. 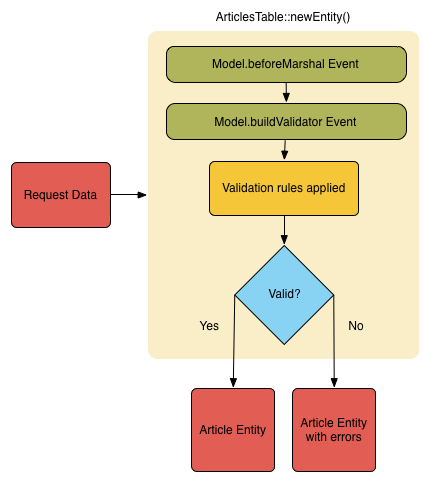 Because of how the marshalling process works, if a field does not pass validation it will automatically be removed from the data array and not be copied into the entity. This is to prevent inconsistent data from entering the entity object. Moreover, the data in beforeMarshal is a copy of the passed data. This is because it is important to preserve the original user input, as it may be used elsewhere. The Validating Data chapter has more information on how to use the validation features of CakePHP to ensure your data stays correct and consistent. There are two ways of protecting you against this problem. The first one is by setting the default columns that can be safely set from a request using the Mass Assignment feature in the entities. Using this feature is handy when you have many different functions your users can access and you want to let your users edit different data based on their privileges. The fieldList options is also accepted by the newEntity(), newEntities() and patchEntities() methods. Deprecated since version 3.4.0: Use fields instead of fieldList. Rule checking will be started if not disabled. Rule checking will trigger the Model.beforeRules event. If this event is stopped, the save operation will fail and return false. Rules will be checked. If the entity is being created, the create rules will be used. If the entity is being updated, the update rules will be used. The Model.afterRules event will be triggered. The Model.beforeSave event is dispatched. If it is stopped, the save will be aborted, and save() will return false. Parent associations are saved. For example, any listed belongsTo associations will be saved. The modified fields on the entity will be saved. Child associations are saved. For example, any listed hasMany, hasOne, or belongsToMany associations will be saved. The Model.afterSave event will be dispatched. The Model.afterSaveCommit event will be dispatched. See the Applying Application Rules section for more information on creating and using rules. If no changes are made to the entity when it is saved, the callbacks will not fire because no save is performed. // In a controller or table method. When you are saving an entity, you can also elect to save some or all of the associated entities. By default all first level entities will be saved. For example saving an Article, will also automatically update any dirty entities that are directly related to articles table. // Save the company, the employees and related addresses for each of them. Your entities should be structured in the same way as they are when loaded from the database. See the form helper documentation for how to build inputs for associations. Associated records are updated in the database or, if not matching any existing record, inserted. Any existing records that do not match the records provided will be deleted from the database. Only provided records will remain (or be inserted). By default the append saving strategy is used. See HasMany Associations for details on defining the saveStrategy. Without the call to dirty() the updated comments will not be saved. Without initialization calling $article->comments = $comment; will have no effect. When converting request data into entities, the newEntity() and newEntities() methods will handle both arrays of properties, as well as a list of ids at the _ids key. Using the _ids key makes it easy to build a select box or checkbox based form controls for belongs to many associations. See the Converting Request Data into Entities section for more information. Only new links will be created between each side of this association. This strategy will not destroy existing links even though they may not be present in the array of entities to be saved. When saving, existing links will be removed and new links will be created in the junction table. If there are existing link in the database to some of the entities intended to be saved, those links will be updated, not deleted and then re-saved. See BelongsToMany Associations for details on defining the saveStrategy. Without the call to dirty() the updated tags will not be saved. When saving belongsToMany Associations, it can be relevant to save some additional data to the junction Table. In the previous example of tags, it could be the vote_type of person who voted on that article. The vote_type can be either upvote or downvote and is represented by a string. The relation is between Users and Articles. See the Creating Inputs for Associated Data documentation for how to build inputs with FormHelper correctly. Tables are capable of storing data represented in basic types, like strings, integers, floats, booleans, etc. But It can also be extended to accept more complex types such as arrays or objects and serialize this data into simpler types that can be saved in the database. // Prior to 3.6 you should use ``columnType`` instead of ``setcolumnType``. The code above maps the preferences column to the json custom type. This means that when retrieving data for that column, it will be unserialized from a JSON string in the database and put into an entity as an array. When using complex types it is important to validate that the data you are receiving from the end user is the correct type. Failing to correctly handle complex data could result in malicious users being able to store data they would not normally be able to. the save was aborted by a callback. Using this can be helpful when you performing complex database operations without human monitoring, for example, inside a Shell task. If you use this method in a controller, be sure to catch the PersistenceFailedException that could be raised. As this internally perfoms a Cake\ORM\Table::save() call, all corresponding save events will be triggered. The result will be updated entities on success or false on failure. // Publish all the unpublished articles. A bulk-update will be considered successful if 1 or more rows are updated. updateAll will not trigger beforeSave/afterSave events. If you need those first load a collection of records and update them.